Wow It Happened and It Was Great! Here’s Looking Forward To The 2020 Reunion! WSMR Kids Reunion in 2015? Click on the logo to go there now! A Facebook Group has also been established for WSMRKids memories and chatter. I remember the day JFK was shot….school was let out….think I was in 7th or 8th grade. I remember Mrs. Grable crying. I am 66 years old now. I had Mr. Bell, Mr. Warnake, Senior Paz, ….the English teacher’s name was Clingenpeel…or something like that. I have no idea where my yearbook is. I remember Warnke and Bell. What year and where did you graduate? Would love to connect with friends from when we lived there in 67-71. I was in 5th-8th grade and lived on watervilet (sp wrong). Looking for anyone from 1980-81. Have 2 brothers Mike and Tony Sanchez who were in high school and middle school. My 2 sisters Joann a yr younger than me and Nancy, who also went to high school in Law Cruses. Elizabeth, I do not have your email address and I have no information on your siblings. Please have everyone update their information on https://www.wsmrkids.com/get-listed/ Have you looked at the listing for friends. There are over 20 people on the listing that graduated in 1991. We left in 62 after 4 yrs when dad retired. Would like to hear from others in that range. Was in 8th grade then. Lived at 307 Savannah. Hope this is still working…we lived on Savannah Ave. from ’59-’62. Have many memories of WSMR!! Tom, were you friend with Nick & Ernie Nichols? Tom Hollenbach, I do not see you on the WSMR Kids listing. Check out – https://www.wsmrkids.com/get-listed/g. The listing could give you some answers about friends. You can have siblings do the same thing. Hey webmaster; the comment I posted was directed at Arlene Craighead (Patterson) but went a few lines down. And I could have sworn you graduated in 72. I graduated HS in 1970. Graduated NMSU 1975. I know I had an English class with you, same class also had Bob Oliver and Flanagan, I forget his first name. Did you have a younger brother, David? Maybe that’s who I’m thinking of. Yes, David Fulp is my younger brother and I also know Bob Oliver. Dave is currently in The Woodlands, north of Houston and Bobby is in west Houston. Hope all is well with you and yours. Hi everyone! I lived in WSMR 1961-63. Nice to see there’s a group again! This group was founded 25 years ago. I am looking for someone to keep it going. Sorry that I won’t be able to attend. Thanks for the hard work in putting this together. My brother Bob Thorniley also lived at WSMR ,but attended the high school in LAs Cruces. Many fond memories from my time there. Bill, What is “Your comment is awaiting moderation” mean? Good question. Jim – can you answer this? I want to purchase two t shirts for my brother and I. We won’t be able to attend the reunion but maybe next time. Hope everyone has fun. We lived on base nearly 10 years. I love White Sands. BTW: I don’t see my previous post. Great to reconnect! Is there anyone around who attended WSMR Jr High 67-69? You will then remember Mr. Bell and Mrs. Grable and of course, Mr. Sullenburger! Hey Jim Fulp! Looking forward to the reunion! I had Mrs. Grable for math , Mrs, Zorn for social studies, and Mr. Bell and Sullenburger in 7th and 8th grades ? 1967-1969. I only lived there for 2 years. Seems like it was not that long ago , but I have grandsons in high school. Do you remember Mr. Langley ? Still interested in the reunion? Can you get your registration in by the 8th of August or do you need more time. We left in 62. How can you NOT remember Mr. Bell? Also miss ent, Mr Hoover,Warneke? Mr. Bell always picked on me!! The principal, Mr. Hoover got in trouble for passing out John Birch material…do you remember that? Mr. Bell had me copy the US Constitution after school as a punishment for talking in class. Hi Arlene, I remember Mrs. Grable, and Mr. Bell…he gave me my first “F” and my first “C” in conduct. My parents wanted to know why I got a “C” in conduct. I was at WSMR I think from 1952 – 1956, then again from 1961-1963(?). I don’t know if you will ever see this post, as you posted a couple of years ago. I was good friends with Cheryl Robertson. Hey Valerie, this is Arlene (Craighead) Patterson. Although your name is familiar, not sure I met you, if so it was very briefly. Arrive at WSMR when I was in 5th Grade, let in 1969 after Jr. High School. Missed the reunions, but hope to get to the next one. I know the Starkes (Earl & Sheryl), Emory Davis, Alfred Jackson, Joe, Janet and Belinda Johnson, Teresa Kirby, James Williams, Gail Kaaleekee…. (sorry cannot remember how to spell it my Hawaiian friend), Reuben & Millie Manor, Eric Beyer (glad to make contact with him). There are others but I shan’t go down the whole list. Always wondered what happened to our Choir Director (Mr. West?). Glad to know Us Brats are a tough group and still trying to reach out. Many people don’t realize what it is like to lose connections with friends because of constantly moving. But I would never give up that life! I attended WSPG Elementary from 1954-1957 when my Dad, Col. John Fowler was transfered to the Amerian Embassey in Rangoon, Burma. We then moved to Las Cruces for a year and a half. In 1960 we returned to White Sands and I attended WSMR Jr. High until my Dad retired in 1961. I attended the school from 1954 to 1960. Moved in spring of 60 when we were transferred to Fairbanks, Alaska. Returned to WSMR Oct of 1963 and went to LCHS as a sophomore til I graduated. I am trying to locate you regarding your father’s diary that you sent to me for the 401st Bomb Group Association. I lost your email, etc. My dad was 1st Lt Vince Ledray and he served with your dad in the 615th. We are having our reunion next week in San Antonio at the Holiday Inn Riverwalk. I put everything on the back burner for two years.My husband was diagnosed with cancer July of 2014 and passed away this past Sept. So sorry to have missed your reunions. Hope this finds you and your sisters well. Doris and I got your Christmas card 2 years ago but lost your address and the number that we had in Lordsburg was no longer good. Hope that you will see this post and give us a call @ (575) 522 -5713. So sorry about Joe. You are not listed. so if someone tries to use this 27 year old listing to find you – they won’t. Good to see this site up and running! glad to see it up and running again! 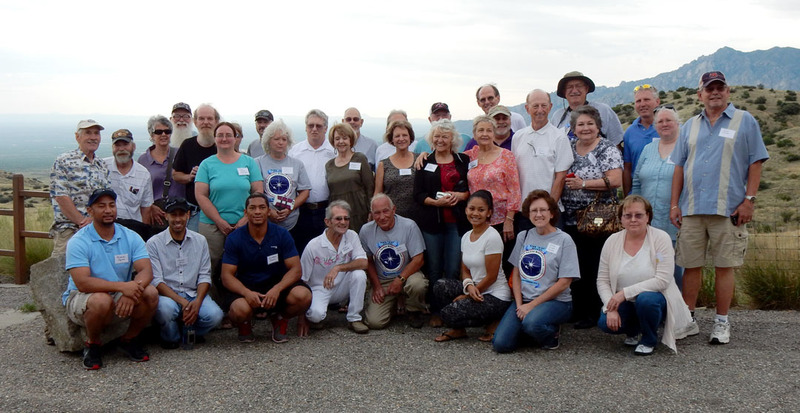 I left WSMR at the age of 14 and have attended several reunions..
i’d love to attend another … that is if the plane includes the ‘OLDER CROWD’ too! Nancy – of course the older crowd is invited. Watch you emails. Looking into a ALL BABY BOOMERS reunion possible in 2020. Yeah Nancy!!! Carol Dyhrmann will be attending with me. I’m excited to reconnect with so many I remember when we were so young. My name was Donna Hayes and I am now 51 yes old/young. I would love to see yearbooks from 1970-1976 & even be able to purchase them to show my children & grandchildren. Diane Garrison English will not be able to attend. Bernie – Thank you for the note. Yes here are a lot of pictures out there. People can email them to Jim – the webmaster or post them on facebook. If you don’t have access to facebook, send them to [email protected] and he will post them. There are many pictures in the five reunion publications. Jaanai – email me your new email address – better yet – submit the form on https://www.wsmrkids.com/getlisted.htm to update all of your information. I still do not have your email address. Go to https://www.wsmrkids.com/get-listed/ – I still do not have all of your information. Jim – I want to thank you for all that you have done. Hope to continue our partnership for many more years to come.